I made a nice batch of Cornbread and Andouille Stuffing with the last of my reserves of homemade Andouille Sausage. I stuffed it into 2 inch thick Pork Chops, grilled them and let them slow cook on the grill under smoldering Pecan wood chips. This stuffing would also be great stuffed in a Chicken, Turkey, Turducken, or Peppers. 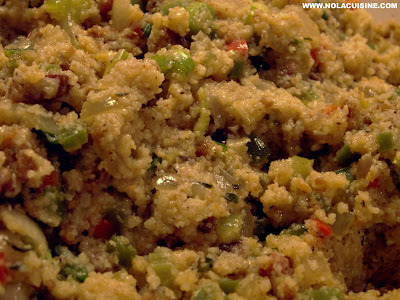 Conbread and Andouille Stuffing Recipe at Nola Cuisine! Be sure to check out my ever growing Index of Creole and Cajun Recipes which links to all of the recipes featured on Nola Cuisine! Yes ma'am, this is what I'm talkin' about! I enjoyed some of these posts, thanks for writing. I will share them with my colleagues. Is it ok if we include some of your posts in our newsletter? We will link to your site, of course. J I think our audience would enjoy these tidbits from time to time – they are all food and beverage industry professionals. You can email me at the address I provided.